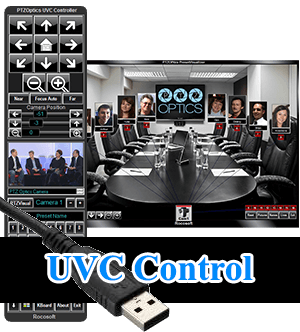 The Rocosoft Pro IP control software for PC uses IP control, making this software extremely useful for large venues where you can’t always access the camera easily. 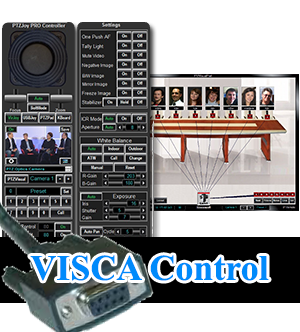 Once configured, simply choose a camera and begin controlling. There are many different ways you can now control your camera(s), such as the virtual joystick, a wired or wireless USB joystick, the PTZPad, hotkeys on your keyboard, or the WebRemote. The PTZ speed can be adjusted for slower or faster movement of the camera. When calling presets it can become cumbersome to have to remember all of your presets, especially if you have a lot. You can set up to 255 internal camera presets, making your options practically limitless. The first 9 presets have the option to have a custom graphic to keep everything running smoothly. These graphics can be any .jpg type image, but we suggest using the Snip button that will take a snapshot from the camera and crop it to size for the Preset Visualet. 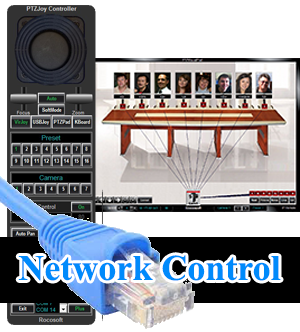 When using this software you can connect up to 6 cameras. Just like the Preset Visualets, there are Camera Visualets that give you the option to name and change graphics for the cameras connected. The Visualets are one of the most important features in the software because they save users time and makes for a more user friendly environment. As you can see, the Preset Visualizer is a highly effective way to precisely swap to the correct preset. Simply double click the box or custom graphic and you’ll quickly jump to that position. You have the ability to swap out the numbered boxes for actual user photos or specific objects of interest. When using the Preset Visualizer, you don’t have to memorize each preset. This saves time and makes for a more user friendly environment. When swapping cameras the Preset Visualizer will update to the new Visualizer if you have one set.